“Setting a lower temperature will cool my home faster.” If you like your house to be at 72 degrees, you may think that setting the thermostat at 68 will help it cool down faster. Air conditioning units don’t work that way. The unit can only cool your house at a set rate of speed, which means setting it at 68 only increases its running time. You won’t reach 72 any faster or slower by setting a lower temperature. “A more efficient unit will automatically lower my bills.” While an air conditioner with a high SEER (Seasonal Energy Efficiency Ratio) will cool your home more efficiently than one with a lower rating, that assumes that you run the new air conditioner for the same amount of time that you ran the old one. Run it more often, you might be using more energy (but for a greater amount of cooling). Other factors, such as leaky ductwork or poor insulation, will also prevent your high efficiency unit from cooling your home effectively. “Turning on a fan will cool the room.” Fans don’t cool the air. They just move it around, creating a cooling sensation against your skin. If you run a fan, you’re incurring energy costs and if you’re not home to enjoy it, you’re essentially wasting that energy. If you have questions or concerns about your air conditioning system, don’t hesitate to contact an expert. The professionals at Quality Air Heating and Air Conditioning can help you select an air conditioning service that matches your needs without the distortion of misconceptions. 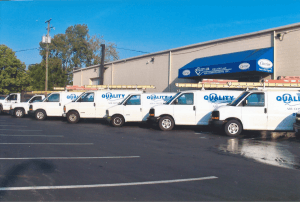 We handle air conditioning in Columbus, OH and throughout central Ohio, so give us a call today!